We sat outside yesterday after an afternoon spent in the garden. The rain which had been forecast hadn’t happened, and with any luck we’d beat the forecast tomorrow as well, when I was due to run a mountain stage of the Welsh Castles Relay. Odd to think the race was already half done. This morning the wind blew and the rain sliced down in diagonal lines. I pinned my number on my vest, packed some dry clothes, a banana, a flask of sweet tea. We arrived in Brecon — me, Dan, Fynn, Cai, Schnorbie — in good time, but to no obvious sign that stage 15 of the race would be finishing and stage 16 starting. Had we found the right place? A brief damp tour of the city centre later and runners had started to gather outside the Wellington Hotel. We huddled in an archway, shaking legs, keeping warm. Like penguins, someone said. Soon after the final runner signed in we were off. The road began to rise as soon as we left town, heading up into the Brecon Beacons national park. Water streamed down the gutters. Supporters gathered in lay-bys cheering us on. Now we were out of the tree line and on the mountain proper. The peaks were shrouded in mist. Streams tumbled white and fast. I was moving up the field. Sooner than I expected came the sign, one mile to go. I pushed on. The road neared the pass leaving us suddenly exposed. The wind ripped into us. I couldn’t slow down now, couldn’t let those runners I’d passed catch me again. 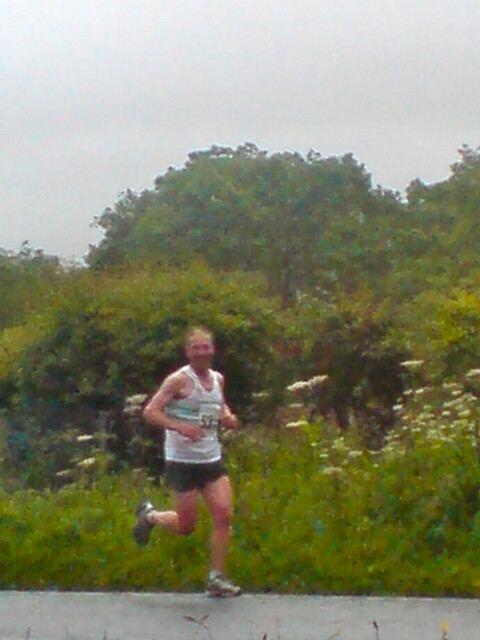 Dan was at the side of the road cheering me on, running with me. “How far to go?” The wind tore away his reply. Not far. It couldn’t be far. How did I do? Not sure. I just wanted to get out of the wind, get warm and dry. At the start of the stage Gary said we were the second place veterans team but some 30 minutes behind the first place team. I hope Ifan won the Jeff Wood stage. We drove back to Swansea and refuelled at the Uplands Diner. Quite how an event like this ever gets organised, I don’t know — so my thanks to the organisers, especially to Gary who sorted out the Swansea Harriers veterans team. Thanks too to Dan, Fynn, Cai and Schnorbie for transport and support.